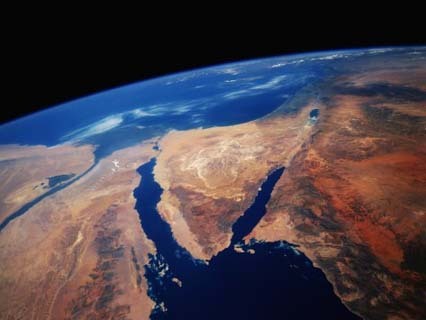 The far northern end of the Red Sea is divided into two parts (gulfs) by the Sinai Peninsula; in the west the Gulf of Suez, and in the east the Gulf of Aqaba. The Gulf of Suez, an important shipping route for oil and other products, lies along the edges of the African country of Egypt and the Sinai Peninsula. In the north, the manmade Suez Canal provides access to the Mediterranean Sea. The Gulf of Suez is approximately 195 miles (314 km) in length. The width runs from 12 to 27 miles (19 to 43 km).